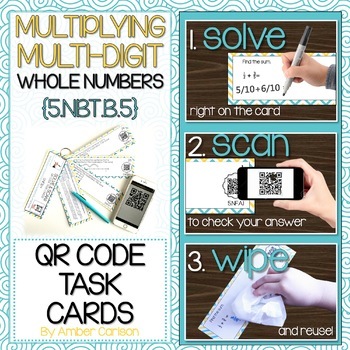 Multiplying Multi-digit Whole Numbers QR Code Task Cards give Immediate Feedback! →The QR code links(answers) are hosted in Google Drive. Please note that if your district blocks Google Drive, then your district devices may not be able to access the QR codes. In this case, you can use non-district devices to access the codes, or the printable answer key (included in the product download). 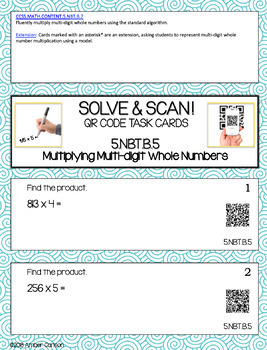 These are not your average task cards! So what makes them unique? →1.) The shape: Rather than being small and square, these task cards are longer and rectangular. This makes them perfect for storing on a binder ring but students can still easily see each question, card number, and QR code. →2.) Space on each card for student work and answers: I specifically left space for students to complete their work right on the card! Simply, laminate, and let students work on them with a thin expo or vis-a-vis. No extra paper needed! But there is still a student answer sheet included as an option for using the set with groups or the whole class at once. →3.) QR Codes give immediate feedback: Simply scan the code with any device or computer! Students can see immediately if they are correct. No more completing an entire worksheet incorrectly! Printable answer keys are also included. 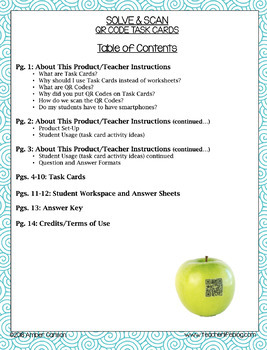 •Why should I use Task Cards instead of worksheets? 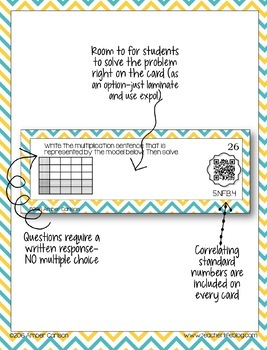 •Why did you put QR Codes on Task Cards? •How do we scan the QR Codes? •Do my students have to have smartphones?